Windows® 7 Professional (32-Bit OS). Offering two PCIe x16 slots as well as ample power for its range of supported graphics cards, the Dell Precision T5500 works quickly to bring your complex design, animation, imaging or engineering projects to life. Enjoy peak performance from the latest in workstation-class graphics cards: The T5500 can be equipped with your choice of professional graphics options from ATI® and NVIDIA®. The T5500 helps ensure superb performance with excellent reliability by providing tested or certified graphics drivers for a wide selection of workstation applications. Dell partners with leading independent software vendors (ISVs) to certify system compatibility, ensuring that the certified workstation applications you load onto the T5500 will run gracefully right out of the box. The Dell Precision™ T5500 offers a high level of energy efficiency and conforms to major worldwide energy standards, including ENERGY STAR® and EPEAT* registered configurations. Due to advanced motherboard and fan design from Dell, the T5500 provides a highly effective and energy-efficient chassis capable of operating quietly even when configured for incredibly demanding tasks. 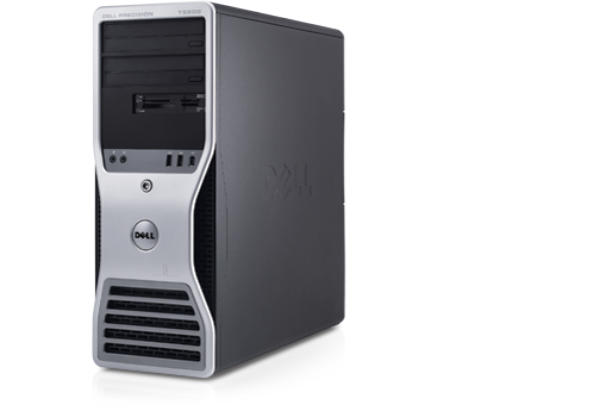 The Dell Precision T7500 tower workstation features an 88% (80 Plus® Silver Certified), wide-ranging power supplies for environmentally conscientious computing that doesn't sacrifice on performance. Professional, proactive and proven support services designed to address the technology challenges you face today. Next, Dell ProSupport Options align to the way you use technology — rapidly responding to your needs, protecting your investment, your productivity and your sensitive data, and providing enhanced proactive support services to reduce the risk and complexity of managing your infrastructure. Dell offers custom factory integration services to help accelerate your system deployments. We can perform a range of services such as custom configuration, consolidation and integration in our factory so that you can deploy your systems right out of the box. ImageDirect™ is a web-based, hosted image management service that enables customers to easily create, manage and load custom images for Dell commercial client systems. Dell offers comprehensive training services which include hardware and software training, as well as PC skills and professional development classes. Our flexible approach allows you to tailor classes to the needs and busy schedules of your employees with instructor-led classrooms or virtual courses, and even self-directed on-line options. Dell training can help improve system reliability, maximize productivity, and reduce end user requests and downtime.